Closing techniques in 3 simple sales tips that you can add to your selling pitch now and make closing the sale easier and more effective. Many sales people try and hide or disguise their real intentions of selling to the prospect. This can be because they don’t want to frighten off the potential buyer. Sometimes it is because they have used a non-sales reason to help get them through the door, such as a free survey or audit. If you try and hide the fact that you are selling to a prospect you can be causing objections and barriers to the sale. At some point in your conversation with a prospect they will realise that you are trying to close the sale. They pick up on your closing techniques and may feel mislead. When this happens it makes closing the sale very difficult. You may have lost credibility and the prospect could feel they have been deceived. The best sales tips on closing the sale: Start at the early stage of the sales process by letting your prospect know you are going to ask them to buy from you. At the beginning of your sale, at the Sales Introduction stage, set an agenda for the meeting with your prospect. Even if you sell using a very short and to the point sales pitch, such as some retail or direct sales people do, you can still set an agenda. If I can ask you a few questions, then show you what I can offer, and if you like what you see I will ask if you want to buy it. Obviously you use your own words and make it specific for your prospects and products. Sales tips 2. Gain agreement throughout the sales process. Closing the sale is not an isolated part of the sales process, despite what some sales training presents. In this second of the sales tips consider how to use closing techniques to stack up the level of agreement you are gaining throughout the sale. Gain agreement at each of the sales stages of your selling process. Don’t leave it until you get to the closing stage before you ask for any agreement or commitment. And, that they will move with you to the next sales stage and let you ask some questions to discover their needs. Before moving from the sales questions to presenting your sales proposal you summarise and gain their agreement that you have all the information related to what they would like a product to do for them. After you have completed your sales presentation you then use trial closing techniques to test the water before asking a definite closing question. If you could get all the features and benefits you have just described from one product, would you be happy to buy it? As with all sales training you change the words and phrasing to make it appropriate for you and your customers. It may sound obvious, but you would be surprised at how many sales people I coach out in the field that do not attempt to close the sale. They do a really good presentation that grabs the sales prospect’s attention, but instead of asking for the sale they carry on presenting features and benefits. Eventually they lose the buyer’s attention and the moment to strike has gone. The buyer loses interest and the conversation drifts away from the product or smoke screen objections start to appear. 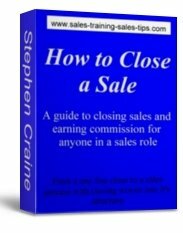 Once you recognise that you are not using closing techniques when you should, or that your sales closing is not as effective as you would like it to be, you can do something about it. How to close a sale will show you how to avoid common closing mistakes, and using the right sales closing techniques with confidence, you will close more sales and earn more money. Learn to choose the right way to close for your product or service, and how to put it into action effectively. How to close a sale by grabbing their attention and adding a close onto a sales presentation. Works for products of all values and can be adapted for any market place. How to weave closing the sale into the sales process starting with the introduction. Great for large ticket items, technical sales and some service selling. 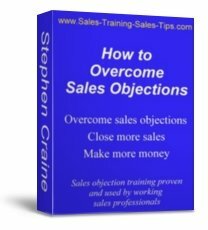 This sales training course, in a compact training workbook, will show you everything you need to learn how to close a sale. 40 Pages of straight to the point sales training on closing sales. No waffle to pad out hundreds of pages, and no complicated selling techniques that don’t work outside of the sales training classroom. Sales training designed for sales people to pick up quickly and easily put into action in real sales situations, not just training role plays. You can download the course to your PC now and start using it today. 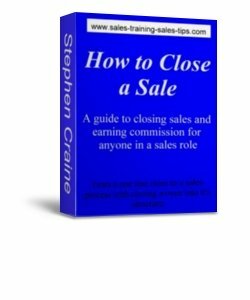 Use the button to buy and start closing more sales today, or for more information on the eBook training course open How to close a sale.